Over the years New World Records has done yeoman’s service in rescuing classic recordings of 20th century American music from defunct or disinterested labels and newly documenting neglected historic (and contemporary) scores – this release being a remarkable example of the latter. 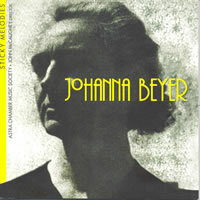 The German-born Johanna Beyer came to the U.S. in 1924 at age 36, and quickly gravitated towards a group of unconventional Modernist composers including Henry Cowell, Charles and Ruth Crawford Seeger, and Dane Rudhyar. According to the extensive explanatory and revealingly analytical program notes by advocates John McCaughey (who also conducted the Australian-based Astra Chamber Music Society in these performances) and Larry Polansky, Beyer’s most provocative music was constructed between 1930 and ’37 – the period from which all but one of these pieces was taken – although she continued to compose, albeit in a simplified and accessible style, until her death in 1944. After that, her music was forgotten until the 1960s, when Charles Amirkhanian initiated some interest in her unusual scores, leading to isolated recordings of the exotic percussion piece “Music of the Spheres” and a few of her piano studies. Polansky introduced the Astra ensemble to Beyer’s music, resulting in concerts in Melbourne and eventually this commission from New World. Tellingly, all of the music on these two discs are world premiere recordings. I used the word “constructed” above because, as Polansky details, Beyer adopted an intricate mathematical process of composition, influenced by the “dissonant counterpoint” theories devised by Cowell and the Seegers, which determined many of the specific proportions of the musical material. Beyer’s personal choices in combining and contrasting these components, however, were often stunningly imaginative, and gave the music its original character – from the layered offbeat rhythms and extended, wandering, mysterious allure of the “String Quartet No. 1” to the winding chromatic pull and sprightly dance episodes of the two “Suites for Clarinet.” Despite its methodology, Beyer’s music never sounds clinical or predictable. Although her writing for chorus is idiomatic and relatively conservative, the songs for soprano and clarinet offer pure melodies with lyrically abstracted counterpoint. Her most radical approach comes in the way she blends different degrees of activity – including intense glissandi, surprising melodic contours, and “tussling” (the apt description is McCaughey’s) rhythmic shapes – between instruments in the two string quartets; the second is half the length of the first, and alternates between contemplative, playfully Ivesian (featuring a quote from Mozart), and ethereal moods. These quartets present sound-forms as unusual and striking in their way as Brancusi sculptures. The program ends with an atypical solo piano “Sonatina” from 1943, Haydnesque in its classical poise and moderate sturm-und-drang dissonance. This valuable release raises Beyer from the status of an historical footnote to a position of significance in the early 20th century Modernist exploration that ultimately affected composers like Elliott Carter and James Tenney – and makes one wonder what other equally fascinating music has fallen into the cracks of history, awaiting discovery. Carry on, New World. The formula behind this recording is daunting. Two musicians who have not played before meet to improvise. They reserve a hall and engage a recording engineer. Over two successive days they play and record four performances, each wholly improvised, each an hour in length. 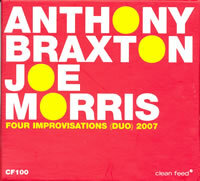 The results—the complete works of the Braxton/Morris--duo are released here. The process is similar to that underlying the two CDs of Hour Glass (on Emanem) in which Tony Bianco described the decision to record hour-long improvisations with Paul Dunmall: “It's not that we were trying to run a marathon, just that when you play for that amount of time sometimes you run into certain musical episodes that are amazing. It's like you have to somehow be in contact with the whole piece from the beginning 'til the end and try to make it stand together without losing the spirit.” The same process is at work here. On each piece Morris plays guitar virtually continuously while Braxton gradually shifts through the spectrum of his saxophones, arrayed from E flat sopranino through B flat soprano, alto, C melody, Baritone, bass and contrabass. There is very little cat-and-mouse or follow-the-leader or lose-the-pursuer improvisation here. Often Braxton will establish an initial direction, sometimes tentatively; the two begin to shape a mood and the music (not just a dialogue—usually they’re playing the music continuously, not apparently “talking” about it or “discussing” where it might be) proceeds from there. Each is a master of phantom bopping, playing close to standard changes or a cycle of fourths to establish a transient coherence until one pattern lapses, disappears or give way to another. While Braxton achieves a multiplicity of voices in part through the sheer number of his seven saxophones and a host of attendant techniques, Morris does an extraordinary job of finding different sounds and relationships within a lightly amplified archtop guitar, spinning out lightning runs of resonant harmonics or muffled boppish or serial-sounding lines, all finding certain accord in Braxton’s own developing parts. Form is both given and taken, but it’s established spontaneously. 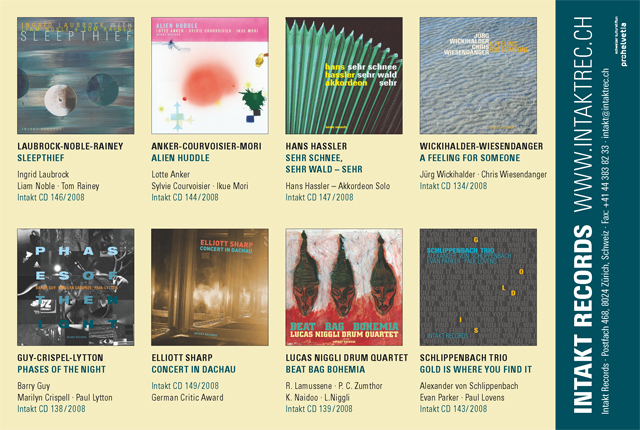 There’s mercurial musical intelligence almost always evident here and it consists not in an epic of mimesis but in the assured sense of each musician working a shared ground in which concordances might arise both inevitably as well as deliberately. It hardly matters if it’s the rapid bass sax sputter midway through “Improvisation III” against what sounds like a small orchestra of mbiras (there’s a lot of Africa in Morris’s guitar vocabulary), or the host of Indian and Japanese sonorities that Morris seems to command from his guitar. Braxton long ago codified the languages of his music and the saxophone (from wide intervals to pointillism and long tones), and he’s a master of creating large scale contrast between transient harmonic systems, and contrasting emphases between linear and sonic/timbral approaches. He can circular breathe and talk through a saxophone at the same time, while Morris finds a percussion instrument to bounce across his strings. Braxton can also use his bass horns to create layers of texture over which Morris’s guitar lines can dance. The result and maybe the surprise is the extent to which the two create continuously listenable music because they’re continuously listening to the larger patterns and not just the simultaneous instants of one another’s craft. It’s music for the long haul (the hour glass) just as it’s music for the instant. It’s also wonderful to hear how Morris can develop a texture out of the remains of a duo passage, gradually arching it into a new terrain before Braxton joins in, in another range, again. It’s an admirable way for Clean Feed to mark its hundredth release and a rare achievement by two major musicians. François Carrier has a delicious goose-down saxophone tone, but what’s intriguing about him isn’t simply the soft-edged delivery, rare in free jazz, but the sense that his grasp of freedom has been earned with effort, taken on with due care, and evolved with due seriousness rather than merely adopted as a new party line. There’s nothing lulling about his playing, however. Carrier grabs and holds one’s attention, his background in more structured forms coming through again and again in these three improvisations. The Canadian has been around for long enough to amass an impressive discography. He and drummer Michel Lambert aren’t quite joined at the hip, but their musical chemistry is increasingly evident. The previous Kathmandu (FMR) was a stirring duo performance which clearly derived some of its presence and authority from the unusual setting and provenance. Last year’s Open Spaces (Spool) was a collaboration with Dewey Redman, who died shortly afterward. On that set, Lambert reminded me strongly of Billy Higgins, not so much in terms of timbre and sonority as in his relationship with the horns, supportive but independent, creating time rather than keeping it. In the same way, Carrier always seems to be pushing for new tonal arrangements rather than seeming to dispense them altogether. His and Lambert’s first appearance on Leo was the double set Happening, which also featured the between-the-tones probing of Mat Maneri in – no accident, I think – one of the violist’s most effective ensemble performances. Guitarist Reg Schwager (a former pupil of Cecil Taylor) takes on a similar role on Noh, a live quartet date out on Ayler. Though Carrier might seem to work most comfortably within the intimacies of the sax and drum duo, he also invests these larger groups with very considerable personality. That’s the case here, though the instrumentation is betwixt and between and Carrier the only horn. 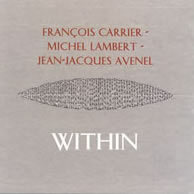 Jean-Jacques Avenel, still best known for his work with Steve Lacy but a formidable player within his own musical language, creates some of the record’s most striking moments, including one of the best contemporary bass solos I’ve heard, but it’s Carrier – who cheekily interrupts Avenel’s long feature – who seems to be shaping the music. It is difficult to tell without known in advance whether the very long central improv develops from a predetermined tonal idea, or whether its informing logic emerged in the course of playing. With Carrier such questions are nearly always an issue and nearly always unanswerable, so not really an issue at all. What one hears is a musician whose grasp of ‘free’ procedures has no aspect of avoidance about it. Carrier is unafraid of metrical patterns – sometimes quite strict ones – which unfold during performance, and doesn’t shy like a pony whenever a harmonic resolution presents itself. A tiresome number of free players still react to beauty and structure in much the same way pre-teen boys react to the prospect of kissing or other slush, with violent tousling and disgusted cries. Carrier simply plays through it and beyond. I don’t hear an obvious influence on his tone, though he has something of Art Pepper’s feathered edge and attractively blurry delivery. His diction is clear but sophisticated. He listens, but doesn’t feel obliged to react to every one of his partners’ actions, another vice of a kind of free playing that makes ‘responsiveness’ the only mark of authenticity. This will not be, I suspect, the most meteoric of careers - Carrier’s too modest and self-possessed a fellow for that – but it already has terrific substance. Within’s an excellent place to start, but it might be worth catching up first. There’s not a wasted note on these tightly constructed, pithy duets between pianist Connie Crothers and clarinetist Bill Payne. Each of the fourteen improvisations sprouts from an initial phrase played by each partner and grows by means of elaborations, variations, and recapitulations of the seed planted by the first notes. Throughout each improvisation, Crothers and Payne remain absolute equals, synchronizing their lines of development without there ever appearing to be a leader and a follower. But they are clearly listening to one another in these intimate dialogues. Each will pick up a hint from the other –mimic a contour, shadow a phrase – but use it only long enough to weave it into what he or she is doing. It’s a kind of a hall of fun house mirrors effect, where images are warped and reflected back and forth until they are utterly transformed. Tempos remain at slow and medium, but there’s lots of variety in other aspects of their collaboration. 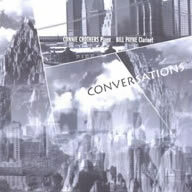 “Conversation #2” is full of short gestures, Crothers making brief sweeping arcs as if she were juggling scarves, while Payne dips and arcs like a dragon fly. “Conversation #4” is a braid, a macramé construction of lines and knots of chords that form beautiful patterns. On “The Desert and the City,” Payne’s clarinet moves like a leaf buffeted by the wind, tracing long peregrinations, then wafting upward in little curlicues, or using multiphonics to jump in place. Crothers under girds and enfolds Payne with a kaleidoscopic progression of chords and note clusters. The precision with which they fit together is uncanny at time. Like all students of Lennie Tristano, Crothers is often branded as cool, but this is very passionate music, a product of intense concentration and discipline as well as emotional openness and depth.